Saratoga National Historical Park is a United States National Historical Park located in the Town of Stillwater, in eastern New York forty miles north of Albany, New York. The park preserves the site of the Battles of Saratoga, the first significant American military victory of the American Revolutionary War. Here in 1777, American forces met, defeated, and forced a major British army to surrender, an event which led France to recognize the independence of the United States, and enter the war as a decisive military ally of the struggling Americans. 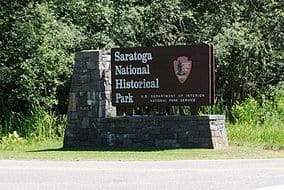 First authorized as a New York state historic preserve in 1927 on the sesquicentennial of the Battles, the Battlefield was made part of the National Park System in 1938 when Saratoga National Historical Park was authorized by the United States Congress. The Visitors Center offers a 20-minute orientation film, fiber-optic light map, timeline and artifact displays. A brochure is available for a self-guided tour of sites in the four-square mile Battlefield in Stillwater. General Philip Schuyler’s Schuyler House is located eight miles (13 km) north in Schuylerville. It is a restored house museum open by tour. The Saratoga Monument is in the nearby village of Victory. The park is located on the upper Hudson River southeast of Saratoga Springs. It contains the famous Boot Monument to Benedict Arnold, the only war memorial in the United States that does not bear the name of its honoree. The memorial was donated by John Watts de Peyster a former Major General for the New York State Militia during the American Civil War who wrote several military histories about the Battle of Saratoga. 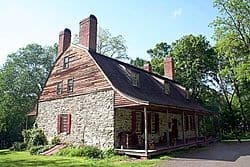 The Marshall House, a National Historic Place, lies eight miles (13 km) north of the main entrance to the Park on U.S. Route 4 and NY 32 north of the village of Schuylerville. Made famous by Baroness Frederika Riedesel in her Letters and Journals relating to the War of the American Revolution, and the Capture of the German Troops led by General Riedesel at Saratoga. 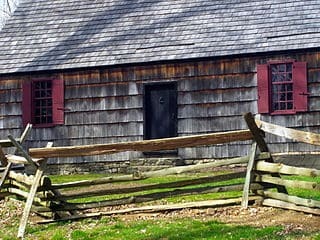 This house was built in 1770-1773. During the closing days of the Battles of Saratoga, Baroness Riedesel sheltered there together with the wives of officers of the British army and wounded personnel. Her account of the travails of those around her, her keen insight into the personalities of the principal officers of both the British and American armies and her devotion to her husband in peril have led some commentators to name her as the first woman war correspondent. The Marshall House was bombarded by the Americans who supposed it an enemy headquarters. Within are conserved cannon balls and other reminders of the ordeal suffered by those who took refuge there. The Marshall House is the sole structure in the battles area surviving. The property is privately owned.